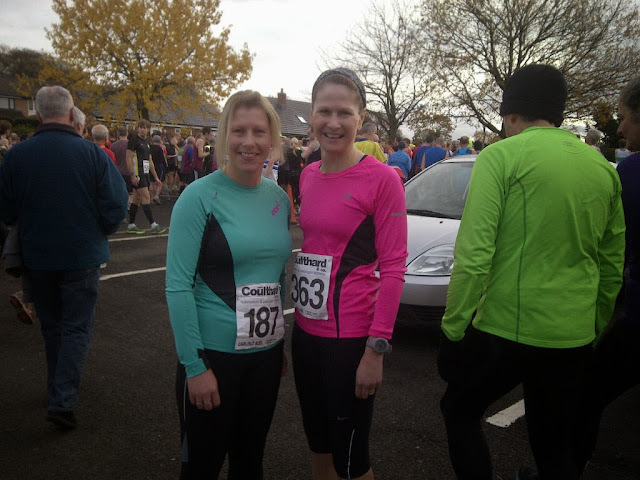 Today, Sunday 17th November 2013 I ran the Brampton to Carlisle 62nd 10 mile run. 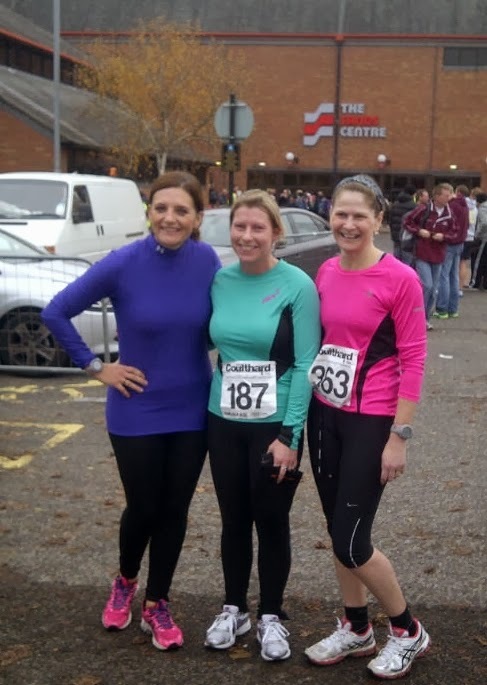 I very nearly didn't run it as yesterday I felt really tired and unwell, but I have had so many DNS's this year due to injury I decided that if I had to crawl round then I would! I got up at half 8 and consumed my normal pre-race breakfast of porridge and a banana before having the usual race day "what shall I wear" dilemma! The problem is the weather can change so much in a short distance! I opted for 3/4 running tights and a long sleeve T Shirt. We left Kendal at around 9.30am for the 52 mile journey to Brampton and after a quiet journey arrived at the Race Head Quarters situated in William Howard School at around 10.50am in plenty of time for the 11:30am start. I collected my race number with no queueing and then went to the toilet but unfortunately I had to wait in a fairly long queue. By the time I had been to the toilet my 2 friends who I had arranged to meet had arrived. We headed outside and before we knew it everyone was flocking to the start line. There was no time to be nervous as the starters pistol fired very promptly - before I had managed to worm my way to near the front! This is a non-chipped event therefore I like to start near the front to give myself the best possible chance of a PB, but it wasn't to be today! I wasn't really fussed as I realised with my recent injuries, lack of fitness and general well-being a PB wasn't really on the cards! However, the weather was perfect for running, dry and around 8C. I followed the crowds round a tight right hand bend out of Brampton and tried to settle into a comfortable pace. The route is fairly flat except a hill at around mile 3. As we reached the top of the hill the route came off the main road and we were soon in the countryside with the fabulous autumnal colours! At around mile 4 there was a water station with bottled water. I grabbed one and continued trying to maintain my pace. Another water station at around mile 6 gave me an opportunity to have an energy gel as my energy was quickly disappearing and I was beginning to struggle. The marshals on route were all very encouraging and friendly which helped when the going was getting tough! Another slight hill at mile 8 felt mountainous and I was being to realise how unfit I had become! My legs were beginning to feel a little heavy but there was a few encouraging spectators who kept me running even though I was very tempted to walk! I was delighted to see the downhill section heading to the finish line. I tried to put on an impressive sprint finish but I don't think I pulled it off very successfully! At the bottom of the hill a sharp left hand turn took me to the finish line ... I had made it!! 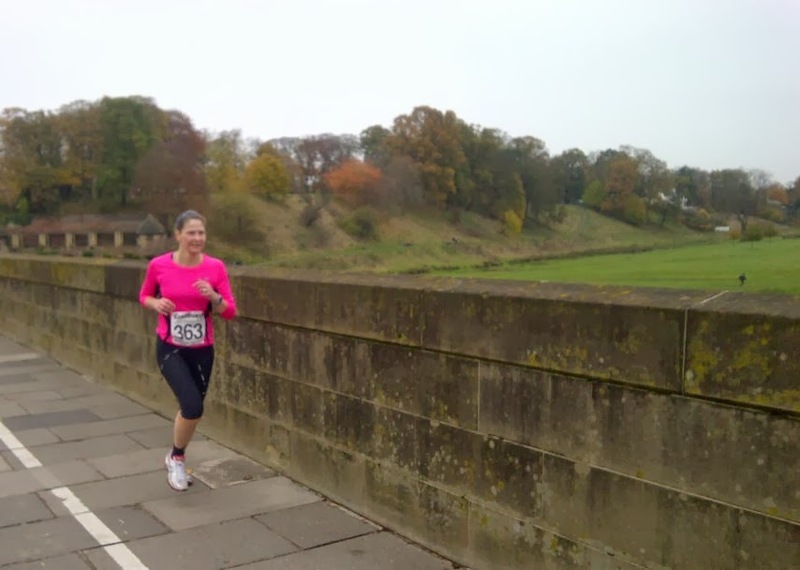 I could hear one of my friends shouting encouragement as I approached the finish! I stopped my Garmin and read 1:32:01, 6 minutes slower than last year but I was still pleased with it! My minute mile splits show that I had started off at quite a good pace but just couldn't maintain it - mile one I set off at 8:41, mile 2 I sped up to 8:18, by mile 3 I was slowing @ 9:00, and I gradually slowed during the remaining miles running @ 8:57, 9:04, 9:26, 9:53, 9:48, 10:01, 9:35! At the finish was I handed a medal to celebrate my achievement? No ... a black beanie hat! Useful I know but I do prefer a bit of useless bling! There was water at the finish but no food! Not a banana in sight! My husband had dropped me off at the start and then he had driven to the finish to collect me! We waited to cheer our other friend through the finish before heading off home for a well deserved shower, food and a large glass of vino! The official results came through very quickly and my confirmed time is 1:32:28. There was 543 finishers and I was very much one of the last at 498th. You can view the run here! and see results here! We had been very lucky with the weather as back home in Kendal it had been raining most of the day and was windy too!